went to Target today... without my wallet! i forgot to take it out of my backpack after walking on the beach yesterday. so embarrasing :( luckily, i was with my mom so i can just pay her back. i think i would have fainted from embarrasment if i was by myself and had to return everything... eesh. 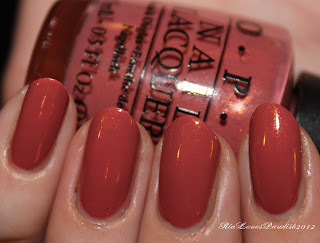 up today is OPI Gouda Gouda Two Shoes from the 2012 OPI Holland collection. it's a very dusty mauve with a great formula, opaque in two coats. it has a VERY slight gold and pink shimmer running through it, the shimmer mostly just adds to the depth of the polish.